Hello all! 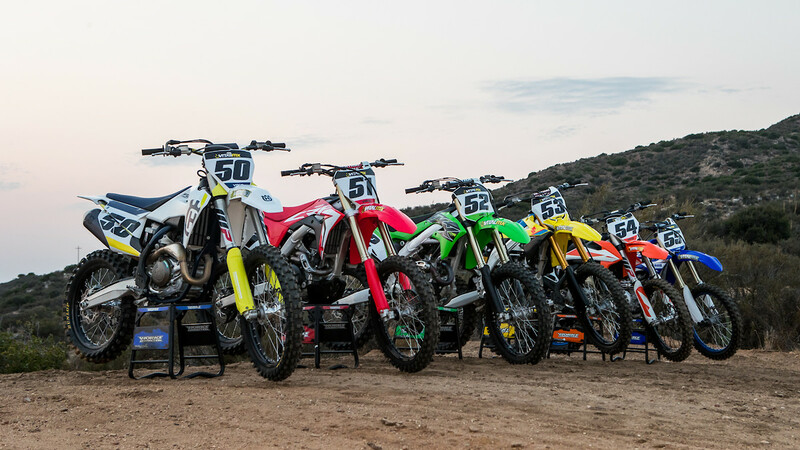 We're opening up our eyes and ears by taking on your questions about Vital MX's 2019 450 Shootout. Pretty simple in here, if you have a question about the test itself, fire away. If you have a question to a specific test rider about their opinions, I'm here of course (Michael Lindsay), Manny Ornellas is a forum regular and I'm sure we can sucker Sean Klinger to making a few stops in here, while the other testers (Blake Savage, Chris Hay, Zach Peddie, and Derrick Caskey)are but a text away for me. I can forward on those questions and see if I can wrangle up an answer. Lastly, we're curious what you, the reader, think of the actual Shootout. Too long, just right, too short (I doubt that, ha)...and what the context in which we cover it. We appreciate any feedback you might have. ML, I know it was mentioned in the video and early on in the article about having the LITPro data available this year per rider per bike: is that coming out at a later time? Not that it's going to sway my opinion, but I think it would be interesting to see as a viewer. Also, what would the best bike have from each of the six contender bikes (i.e. clutch from the Kawi, forks from the Yam, brakes of the KTM, etc.)? I'm heading down to their office in a bit to go over it with them. I'll get it available. As for that answer, that depends on each rider as you can see we like different traits about each bike and some of us don't agree on which of those traits are good or bad. What is the number for the new renthal handlebar on the crf? I would like to try them on my 2018. Sounds like an answer to what I have been searching for. Having to pull them from elsewhere, working on it. Having a hard time telling from the pics, but does the KX still come with 7/8" bars? How could that be possible? Yup, still does. Only one left in the 450 class. Interesting that the suzuki is only 1 pound heavier than the yami (6th vs 1st) I know it needs to go on a diet but not as bad as everyone makes out. Which bike had the least amount of engine braking? How would you rank them in order of engine braking from least to most? Seems like more and more manufacturers are focusing on creating a free revving engine character. In past years, I recall the Yamaha having the worst engine braking which kept me away from it. First off, great work with the shootout! I had just one question, I noticed that the one tester who rated the Husky 2nd commented that he used the "Quick" throttle cam during his test and which improved things for him , did the rest of the testers try the Quick cam? Overall, what I take from this shootout is that the top 5 bikes are all excellent machines which can be tuned with simple adjustments to make almost any rider happy. As someone that rides the 2017 for the last year and a half, I am not too concerned with the result this year , it just shows how great the bikes are this year. 17 KTM 450 SXF - AMAZING! There seemed to be a lot of comments about bar bend which seems totally personal. What bar bends seem to be the most preferred among the group if they could pick exactly what they wanted? I’m pretty sure we all did and I think after a bit they just left it in, I forgot to note it in my write up, it was a big improvement, I was over gripping it on the stock cam a ton to get it turned all the way. Since I kept going to wide open on the Husky since it was so smooth/mellow. I think most of us have a personal one we like more than others. Between myself, Caskey, Peddie, and Hay...probably even Klinger, none of us seem to like the same bars. The engine inertia it displaced plus the placement of that weight makes it feel a solid five pounds heavier than the next heaviest feeling bike once on track, at least for me. I think Vital's shootouts are the best out there. Good work! Nope, just hit the starter button and the system goes active for a couple mins, just hit the starter for split second again to reset that time. The bike doesn't need to be on. How does the yamaha feel in width around the shrouds now compared to the honda ? Well isn't that a great idea... Honda/HRC/GET should take note. Depends on the leg position but the Yamaha still feels a bit bigger at an earlier point and that rolls up to the top, where the Honda feels skinnier at high leg positions due to the shroud ending and not wrapping up to the top of the bike. Maximum width between the two seems to be similar. Which manufacture is your biggest sponsor/advertiser? KTM for the last two years, prior to that it was Suzuki. In the time I've worked at Vital, five years, Yamaha hasn't ever advertised. when/if your test tracks got nasty, which would be yer top 2? Race conditions? I'm also interested in the engine braking. Which one has the most and which one the least engine braking? Also remember that there was a mentiond of less engine braking map for yamah. Any chance we get that map? My personal opinion is this for engine braking. Least to most: Husky then KTM, Kawasaki and Yamaha are pretty close but I'd give the Kawasaki the nod, then the Honda is a bit more than those four but not bad, then the Suzuki still has that old-school four stroke feel...I notice it a ton on this bike. This is of course my opinion, not that of all the test riders, but Kawasaki and Yamaha. Both have phenomenal suspension in stock trim and both chassis help take that extra bit of brunt. How big of a deal is the Yamaha Tuner? It sounds fantastic, but if a bike the Kawi doesn't need a modified tune the value is marginal. Would the same thing be benefical to the Kawi, and if so, by how much?